LeapFrog are a leading toy making company. Their innovative, technology-based toys are not only educational but also make learning fun. Most of their newest learning products connect to the Internet so you can personalise the toy to meet your child's requirements. The Leapster GS is the ultimate gaming system. It has all new features including motion-sensing play, a touch screen and stylus and a built-in camera. It comes with 3 apps included but you can easily get on-line to a library of over 300 games, eBooks and music. Not only that but you can also purchase extra cartridges for an even better gaming experience. Setting up the console really is easy as the instructions take you through it step by step. You basically put the disc into your computer, attach your console using the USB wire included and register your console. You will also be able to add your 3 app's here and set up your child's profile. LeapFrog Connect will then be added to your computer. From here you can purchase more apps and control your child's console settings. You can upload the photos and videos which have been taken on the Leapster GS straight to your computer from here too. The game gets a touch harder as it goes along. You may have to only collect with sillies with a certain number on their tummy and then ones which add up to a correct amount. Be careful though because if you accidently touch a blue ball the screen will splat and if you run out of energy before it clears then it's game over. In this game you start off by trying to stop your opponent from getting the ball into your net whilst also trying to score yourself. Using the arrow keys to move your monkey, you can play this part quite easily. Thomas isn't really old enough to play the rest of this game as it's a lot of addition and mathematics which he's too young to understand at the minute but it will be great for when he gets older. This is definitely the favourite for Thomas. You get to choose you own pet and name, although Thomas keeps changing his. One minute it's a dragon, the next it's a monkey. You can do four different things in the pet pad. Feed your pet. You simply choose what food you want to feed him and then tap it onto the screen and your pet will gobble it up. To get more food simply plug the Leapster into a computer and you can download a daily allowance which is great as Thomas feeds his pet loads. Wash your pet. Giving your pet a bath is fun. Washing, soaping, brushing and rinsing to make sure he is clean and then giving him a blow dry. Playing with your pet. In this section your pet starts off in a sling shot. When the bar gets full you simply tap the screen and he will fly across the screen. Whilst he is flying you need to try to pop as many balloons as you can and hopefully your pet will reach the other side without falling into the water. Spelling with your pet. This is the educational part of the game. Choosing which letter you want to try and whether it will be upper case or lower case, the Leapster will then show you how to write the letter in the simplest way. Once you have done it three times you will get a tick and be able to move onto another letter. The Leapster GS also features a camera, video recorder and microphone. Take photos of whatever you like and then you can edit them afterwards putting drawings, pictures and even adding sounds to them. They can then be simply uploaded to your computer and you can share your child's creations on-line. 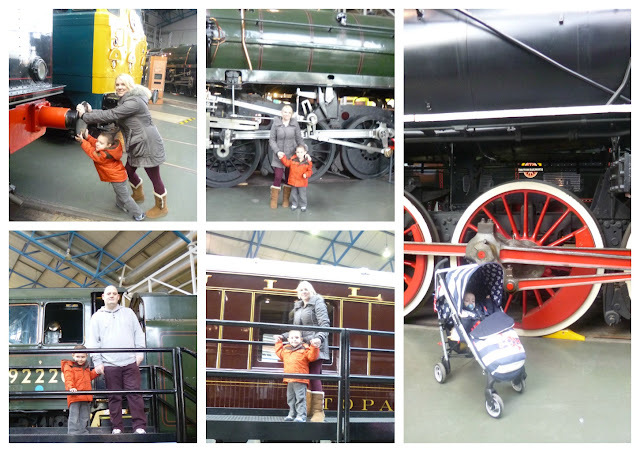 We went to York Railway Museum last weekend so took it as an opportunity for Thomas to get some photos on the train. Very simple to use and the quality of the photos are great too. 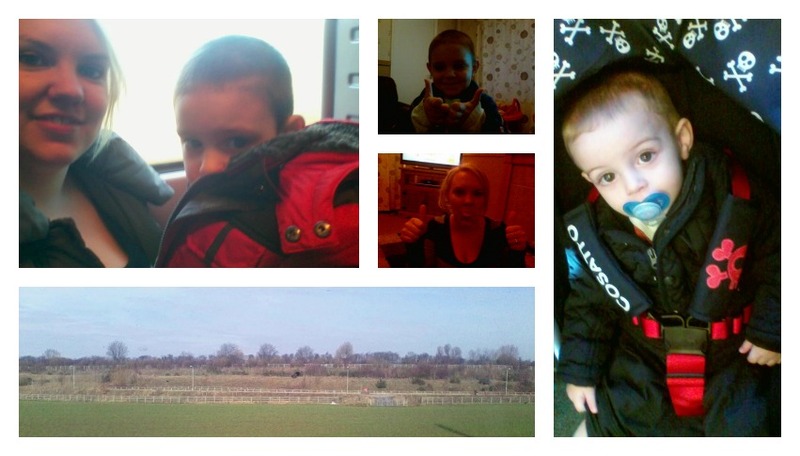 See below for a insight into some of the photos taken on the Leapster GS. Now not only do you get all this but you can also purchase extra games, videos, music and more via cartridges which fit into the bottom of the Leapster GS or on-line by downloading them as apps via the App Centre which has over 300 downloads available. 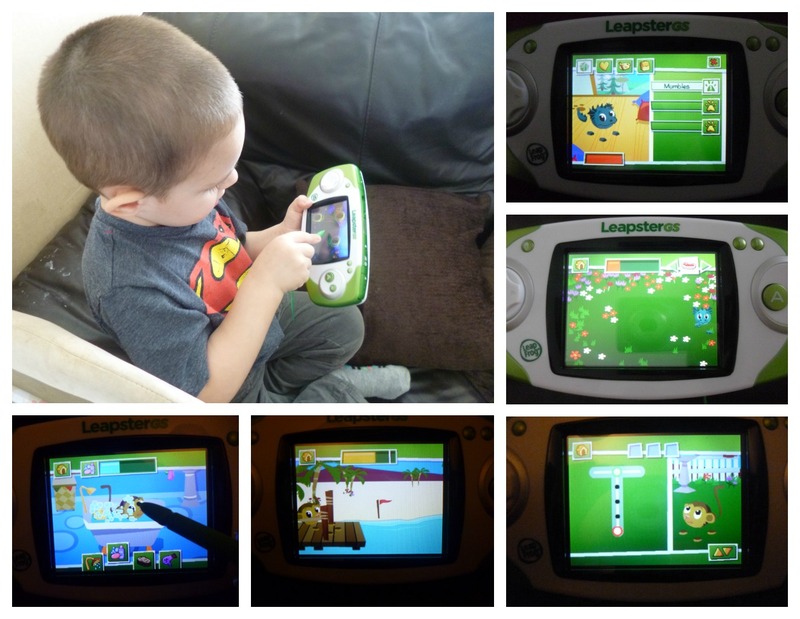 Whether your child is wanting something for fun or an educational toy, the Leapster GS is perfect for them. The LeapFrog Leapster GS can be purchased from all good toy shops and various places on-line with an RRP of £64.99. You can follow LeapFrog on Facebook, on Twitter and on Google+ where they have updates on new cartridges and apps and write about any deals they have on them too. Thomas and Charlie love bath time and as soon as they hear the bath running they will be stripping off and running upstairs to jump in. Although they love it, they do get bored of the usual bathing routine. Washing hair and cleaning themselves does get a tad boring after a while and the toys you can purchase suitable for bath time are usually dull and not really entertaining. Bathtime Buddies from H&A are now here to change that. The range is celebrating its 20th anniversary by listening to parents about what their children like in bathtime toys and have made these points a reality. The new Bathtime Buddies range is brighter, bolder and is more colourful to keep little ones occupied whilst in the bath and they also have an educational aspect too. This is a brightly coloured turtle or duck made of soft fabric to encourage not only washing but play too. To help keep children entertained, the pack features a quirky little rhyme ‘Bathtime’s fun when you've got a buddy, they’ll help you get clean when you get grubby!’ Available from Tesco and Morrisons for £2.00. There are four brightly coloured ducks in this pack which again has a fun little rhyme ‘Rub a dub dub, four ducks in the tub!'. 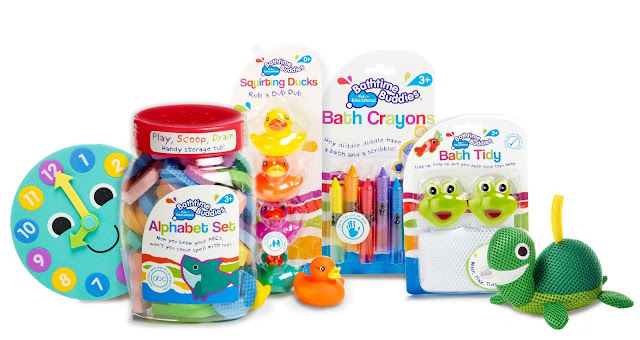 The ducks float and squirt too to help stimulate babies and toddlers in the tub. An essential for bathtime. Available to buy from Sainsbury’s, Tesco, Asda, Morrisons, Superdrug and Wilkinsons for £2.00. Children love crayons so getting to draw in the bath will keep your kids entertained whilst you getting washed. The pack contains six bright crayons that can be used to draw on the bath and are easy to wash away. The pack features the rhyme, ‘Hey diddle diddle, have a bath and a scribble!’ You can purchase from Sainsbury’s, Tesco, Asda and Superdrug for £3.00. The clock sticks to the side of the bath or tiles when wet and will even float on water. 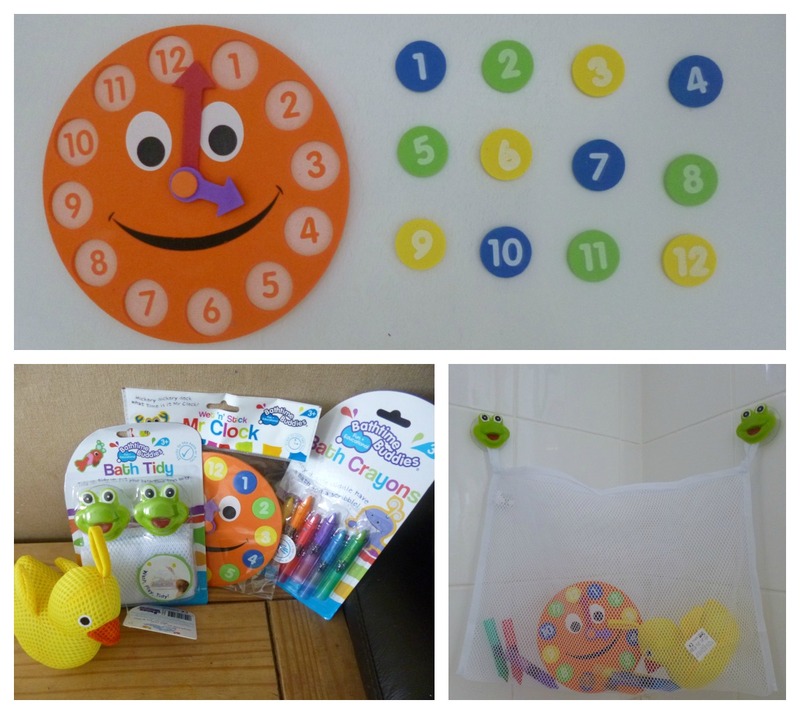 The numbered pieces pop out and the clock hands move around to help children learn to tell the time through bath time play. There is also the new Bathtime Buddies Mrs Clock making it a more unisex product. The Mr and Mrs Clocks are available in Tesco, Asda and Wilkinsons for only £1.25. This set contains 65 colourful foam letters that stick to the bath or tiles when wet. They help children to learn to spell whilst playing in the bath. The lid on the tub has holes in it so after bath time is over you can easily put the letters back in the tub and then turn it upside down so the water drains through the holes. The tub has a fun rhyme ‘Now you know your ABCs, won’t you come and spell with me!’ Available in Sainsbury’s, Tesco, Asda, Morrisons and Wilkinsons for £3.15. The Bath Tidy easily sticks to the bath or tiles helps to keep toys tidy when not in use. The net means that the toys dry out and are clean and ready to use for the next bath time. Again, the pack has a fun rhyme on it ‘Tidy up, tidy up, put your bath time toys away. Hang up the bag to drip and dry and play another day!’ Can be purchased from Wilkinsons for £2.00. We were sent the Mr. Clock, Bath Crayons, a duck Wash Buddy and the Bath Tidy. As soon as Thomas saw his new toys he wanted to go into the bath and get playing. The bath tidy is easy to use, 2 little suckers to hold it onto the tiles which have cute little frog faces on them. The bath crayons were enjoyed by both boys. I was a bit apprehensive to let them use these as I'm a clean freak and really didn't want these leaving marks on the bath. Eventually I gave in and let the boys play with them. 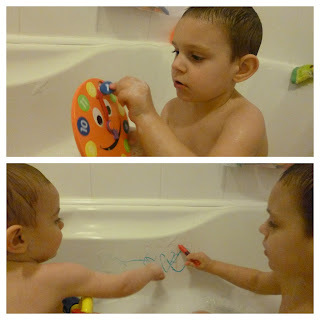 Drawing with all the crayons and then using the wash buddy to wipe the colours off the bath. To my surprise, they cleaned off easily and left no marks at all. Mr. Clock was by far my favourite of them all. Thomas took to this straight away and it is a great way to help children with not only telling the time but counting too. We stuck the clock up against the tiles and then took all the small round numbers out and scattered them around the bath. Thomas then searched around the bath looking for each number in order as shown on the clock and then matched them to the correct spaces counting up as he went along. This really is a great idea as he was counting in order but also recognising what each number was and where it should go. Overall, I'm am very impressed with the new Bathtime Buddies range. They are lovely, colourful bath toys that not only keep both my boys entertained but also have an educational value too. You can check out the Bathtime Buddies range and all of H&A's other products on their website here. Today we've taken our first train journey together. Thomas has been excited all week as he's never been on a train before and we were going to see even more trains at the York National Railway Museum. They have got their Big Fun With Little Trains activities on over the school holidays and today invited parent bloggers to come and try out the facilities and have a look around. Our travels started this morning when we boarded a train from Leeds bound for York. It's only a short journey but Thomas loved his first train ride, looking out of the windows at the animals in the fields and just having to try out the toilet too. Arriving in York, straight away when we left the station we saw York Minster. We didn't go to have a look around it today but it was nice to have a glimpse. Also, we saw the York Wheel. This is a 60 metre high wheel which has breath-taking views over York. 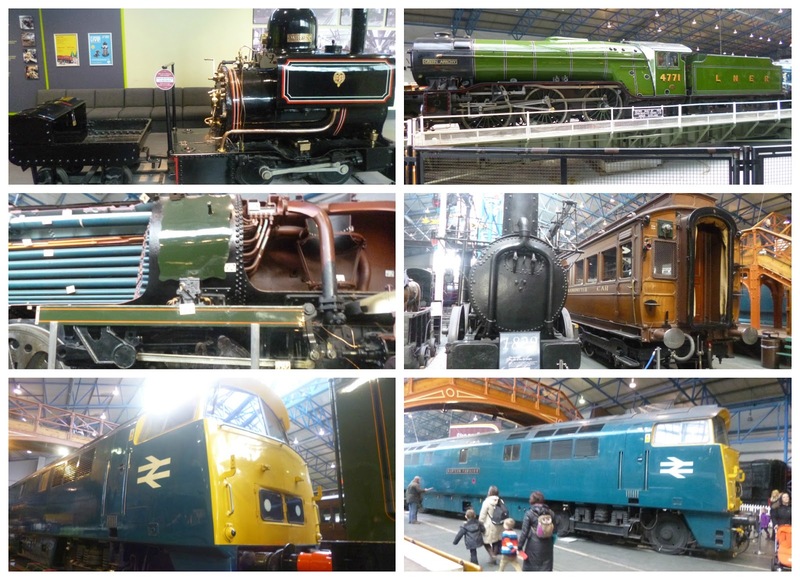 Arriving at York National Railway Museum, we were given all the details of our day ahead, including a map to show us around as it is quite a big place and then we were free to explore. The Museum is free to look around but there is the option of giving a donation to help keep it running. Looking around at the trains I was really taken aback at their sizes, some were just huge. The detail on them and the fact that the museum has preserved them all and even taken extra steps to show the things that would be on board the trains, from thousands of pieces of cutlery to the table settings all in place showing how grand some of the trains were when they were running. It really was great fun seeing inside some of the trains. they had ramps up to them so you could get high enough to view into the actual trains which had all been laid out inside how they would have done when they were on the lines as working trains. We even had a got at trying to push one, with no avail of course. We then found the biggest one we could see, it was black and had red and white wheels. Just to compare, I put Charlie's pram at the side to show you how big it in fact was. The Museum also boasts a few rides too. The miniature steam and diesel trains giving children a chance to have a short ride and then you could pop outside to have a ride on a fully working full sized steam train. This was £2 per person with under 2's going free and is approximately an 8 minutes journey. 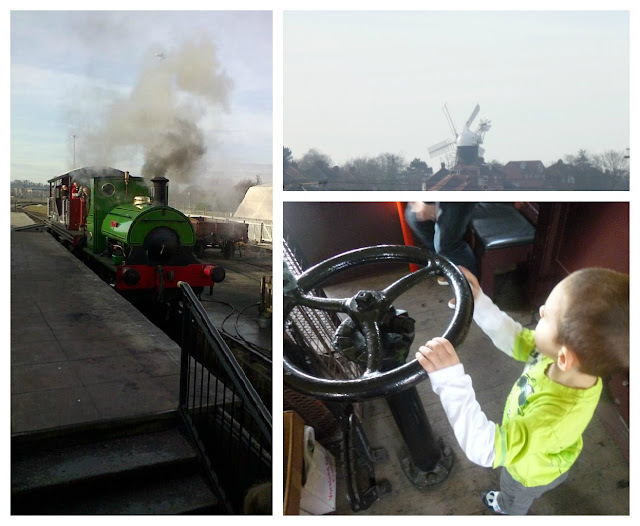 Thomas loved being on the train and getting to see a real working steam train was great. Inside it held a coal furnace and a huge wheel which Thomas could even move as it was so big, bulky and heavy. Outside, there were views all around. We even had a little peak at a windmill out in the distance. 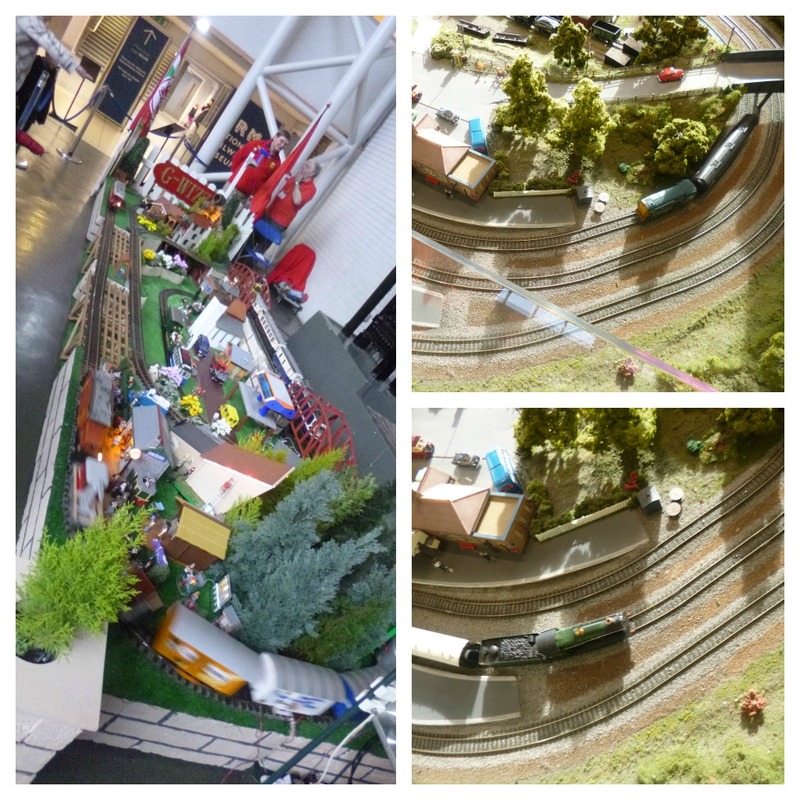 As the Big fun with Little Trains event is all about miniature trains, we popped along to have a looksy at the Garden Railway and the model railway. The details put into these models, not just on the trains but on the layout is fantastic. The buildings, trees and even car are all built to scale to make the model look as real as it possibly could. Thomas loved watching the various different trains going round the tracks, he even wanted to have a go himself at playing with them. As he couldn't play with the models we popped along to see the Chuggington challenges which were taking place there. The Chuggington Stack Track Challenge looked fun and there was a play area where the children got to play with some chuggington trains. It really was Big Fun with Little Trains. As we were at a bloggers event we had a room booked for us which had lunch and some toys for the children. The sandwiches, apt train biscuits and refreshments went down a treat with everyone as did the Chuggington toys which were laid on out each table. It was great to see all the other bloggers there too although apologies if you saw me and I did not recognise you, my memory for faces is so bad. After the boys were all played out and Thomas had received a Chuggington train toy as a present from the TOMY team who were there, we popped down to the gift shop to buy a few bits. 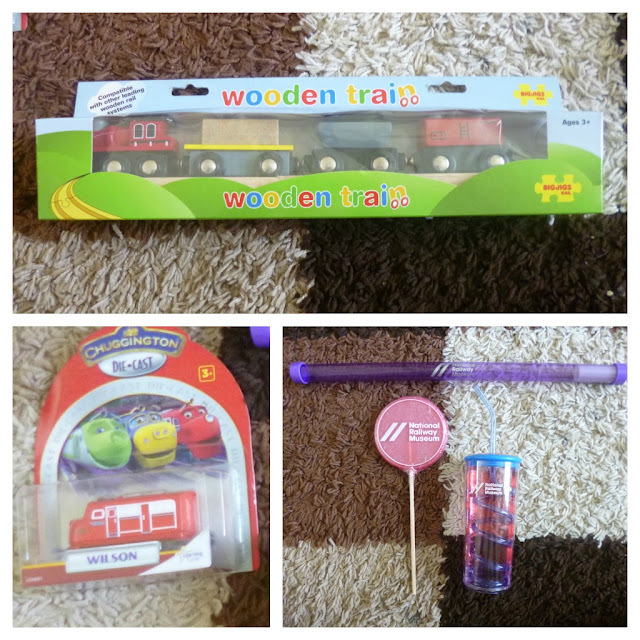 We purchased Thomas a new train for his track at home and some National Railway branded products. A huge pink lolly, a cup with a curly straw and a tube which made squeaky noises. On the train home all Thomas spoke about was trains and how much fun he'd had at the museum, asking when we could return to visit again. Overall, a successful day out and fun for the whole family. I always use deodorants to make me not only smell fresh but feel fresh too. Sometimes though, I get a rash from the chemical used and the scents which are added. Bionsen is different. Bionsen is formulated to be naturally protective. By using natural minerals, Bionsen neutralises the bacteria which causes bad odours, and it keeps them at bay all day long. 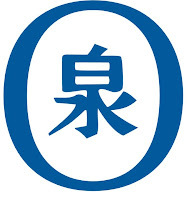 One of the things Bionsen is proud of, is the fact that their products contain no aluminium. They respect the body’s right to cool down and detoxify naturally, which means avoiding any chemicals that interfere with this process by blocking the pores which aluminium does. Bionsen is aluminium and paraben free. This is a great thing to hear because the aluminium and parabens in deodorants have been linked with breast cancer. It is believed that they can pass through the skin into the breast tissue, through absorption and nicks/irritation caused by shaving. Although there has been no proven, definite link between these chemicals and breast cancer, it's best to protect yourself by using a product free of these ingredients. Products such as Bionsen. Bionsen contain Japanese spa minerals such as zinc, copper and manganese. For centuries, the Japanese have recognised the health-giving properties of these minerals and even today, continue the ancient tradition of bathing in mineral spas to nourish and soothe skin. I was sent the pump spray and the roll on to review. I must say that I think the pump spray is a fantastic idea rather than an aerosol. Much better for the environment. The fact that they are suitable for sensitive skin is a big plus for me. I have really sensitive skin and the underarms are also highly sensitive too. Since using them I have had no rashes or reaction from my sensitive skin so give these products a big thumbs up of approval. With long lasting freshness and keep you smelling nice all day without blocking your pores. They are also readily available in all major supermarkets, now including Morrisons and from the Bionsen website. The Pump Spray has an RRP of £2.75 and the Roll on has an RRP of £2.35. You can follow Bionsen on Facebook here and on Twitter here. When people tell you about the joys of being pregnant I'm sure they are being sarcastic. It's supposed to be a happy, smiley time but ends up with sickness, heartburn and the worst of them all, incontinence. Incontinence is such a huge problem in pregnancy and can get even worse after the labour too if you don't do pelvic floor exercises properly. Pregnancy incontinence is caused by your babies growing weight pushing down onto your bladder making you need to use the toilet more often and giving you less control. Thus meaning if you cough, sneeze or even the heave as you go to vomit, you can find yourself trickling a little bit of wee and not being able to control it, sometimes not even being able to stop and ending up with a puddle on the floor. Not a good look but hey you're pregnant, there are worse things to come than a weak bladder. We do pelvic floor exercises to strengthen the pelvic muscles. These muscles are between your legs, they go from your pubic bone at the front of you right round to the base of your spine and they hold your bladder and urethra. These are the muscles we use when controlling our bladders. The pelvic floor can stretch so far in response to weight, however, if it bears weight for a long time, like in pregnancy, the muscles can become overstretched and weak. 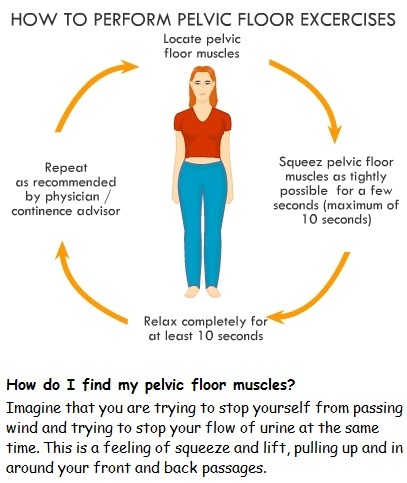 We do pelvic floor exercises to strengthen these muscles back to how they were before and they are super easy to do. You can even get a pelvic floor toner which will help you hold the correct position whilst doing the exercises. Incontinence products are good too, and the ones from Neen Pelvic Health will help in giving you back your confidence. But all in all remember, it's a natural thing to go through in pregnancy. Don't be embarrassed, every other mum has wet themselves at one point during pregnancy and as long as you do your pelvic floor exercises, your bladder will strengthen and you'll be your fine, dry self again. I love doing stuff a little differently so when it comes to Pancake Day I couldn't just go with the ordinary, boring, round pancakes. Instead, we went for stars. Thomas loves drawing star shapes and so I thought this would be the best for him. Now usually I would buy loads of toppings so the boys can try different flavours, but unfortunately, I've been ill since Friday and haven't been able to leave the house meaning we had to raid the cupboards to find out scrummy extras. Add the rest of the milk and whisk until the batter is smooth. Pour the pancake batter into the pan, then tilt the pan to spread the mixture out evenly. After about a minute, it's time to flip. Now you can do this with a spatula but we prefer good old flipping in the air. Cook on this side for 30-45 seconds, until golden brown and then slide the pancake onto a plate. You can then decorate how you like, with whatever you fancy really. 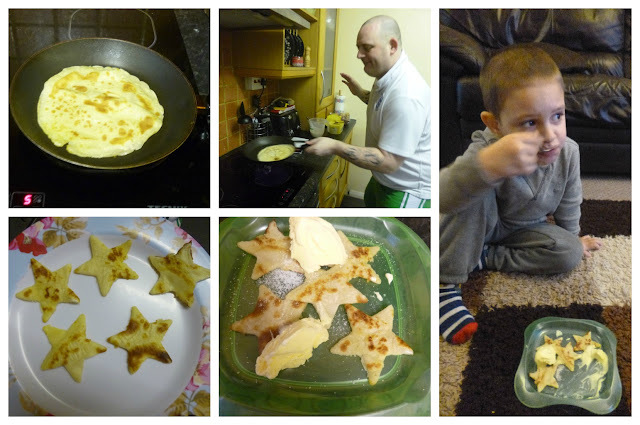 As stated above, we went for stars by just using a biscuit cutter to get the pancakes into shape, a sprinkle of sugar and a dollop of ice cream. And as you can see, they were thoroughly enjoyed. What do you put on yours? This is our entry into the Tots100 and Center Parcs competition. Tots100 have teamed up with Printerpix to celebrate family photography. One lucky blogger will win a brand new Panasonic Lumix DMC-FZ200 Bridge Camera plus memory card worth £500 - Plus another £100 to spend on the Pinterprix website. My entry is into the Children aged 2-4 category. My photo is based on trying to get the perfect picture. Having 2 young children, I know this doesn't happen...ever! Either one child will be looking and the other facing the tv or pulling weird faces but never have I got a perfect picture. That is until I took this one. Now, you may look at this photo and think 'that's not perfect' but it is to me. Photo's don't have to be beautiful smiles, loving gazes or playing together, they just need to be special to you. and this one definitely is. After trying all day to get a photo of my boys together, this was the best of the bunch. 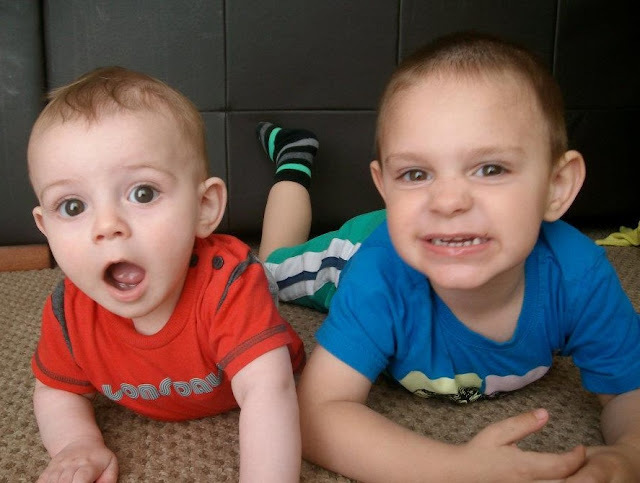 It shows my boys personalities, their funny sides and I just loves the faces they are pulling. For once they are both doing the same thign at the same time... Having fun. And isn't that what being a child is all about? This post is Michaela Britton's entry into the Printerpix Photo competition. Ever since I was pregnant with Thomas I have searched for the perfect maternity bag. The one which is practical yet fashionable, spacious yet not like a holdall and pretty yet not too mumsy. As you can imagine, I've been through loads of them. I think altogether I have had 6 bags and all have had their flaws. I wanted to find the perfect bag for me. A bag which I loved the look of. A bag which held everything I needed for both boys. And then I found it! 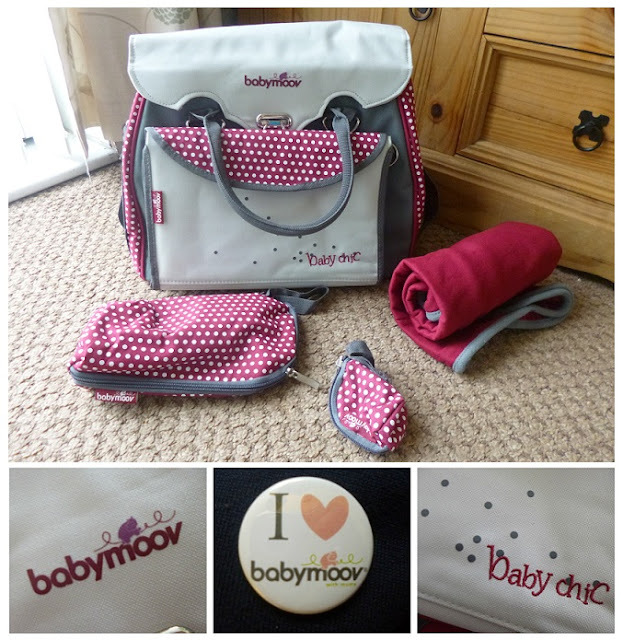 The Baby Style maternity bag from Babymoov. How? How have I never heard of this company? Why have I never seen this bag? I had to have it! And then I did. In front of me, this gorgeous bag which stood out from the crowd. Just from the exterior I could see the quality. 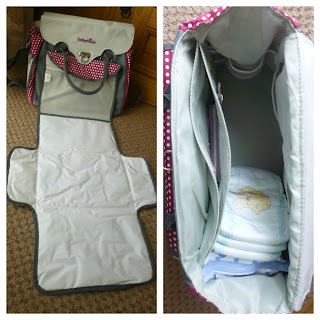 The extras you got with it are everything you would need and want from a maternity bag. An insulated polka dot zipped bag for holding bottles, a coordinating soother pocket, a polar fleece blanket and a handy changing mat which attaches to the front of the bag for easy access. You can tell every element has been designed with mummy in mind. From the quilted shoulder strap for extra comfort, to the fact that every aspect of this bag can be used using one hand. On the inside, I was amazed at how much space was. The multiple storage compartments and pockets for holding everything a busy mum needs. Even a clear pouch perfect for holding nappies. An elasticated side compartment which will hold juice bottles perfectly, a zipped compartment for safety and a velcro one too for easy access. Not to mention that the actual space inside the bag is huge anyway. It can easily hold everything I need for both boys and my stuff too. Each with their own individual style, the Baby Style range has been specifically made to suit all styles of mums. Whether your into bright, bold statements like the Baby Chic or prefer simple, neutral beauty from the Baby Natural, there's a bag for you. 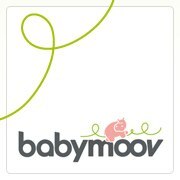 The Baby Style range has an RRP of £44.99 and can be purchased from Amazon, Okkiobe, Tesco and other leading childcare shops. The HiLo highchair has been created as a recyclable, eco product. 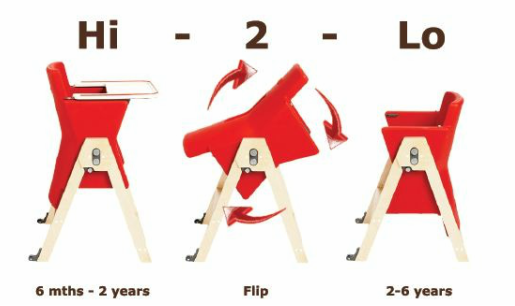 Not only is it a highchair suitable for 6 months to 2 years but it also changes to a chair which is suitable for 2 years to 6 years so you don't need to buy a new product when your child grows as this grows with them. The swivel feature of the HiLo highchair is the most appealing part of the design, it allows you to easily convert it from a highchair with tray for an eating surface into a standard seat that tucks right in under the table. Just simply pull out the buttons which on either side and then push the seat forward till it's upright. 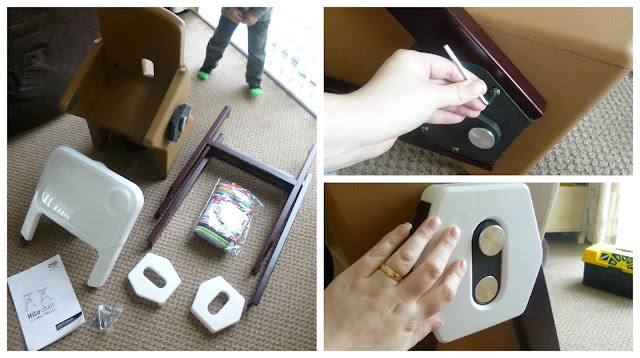 This converts it from the Hi (baby chair) to the Lo (kids chair). From a comfort point of view, the HiLo highchair delivers. It has a molded seat that is comfy for both baby and child, as well as a harness that converts from a 5-point to a 3-point and connects to the crotch bar to provide maximum safety without making your baby or child uncomfortable. 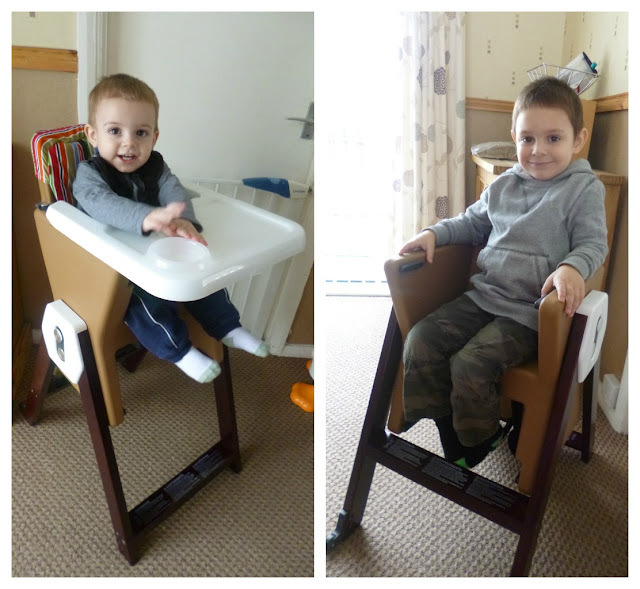 The highchair is great for parents too since it has wheels on the back legs. They provide easy movement around and means no lifting of a heavy highchair. The tray is also super easy to clean with no crevices for food to get stuck down and has a lip on the edge to stop food from rolling off. The HiLo Highchair is available in 7 great colours: black, raspberry, portobello, blueberry, carrot, chocolate and asparagus. The legs are made from solid birch and you can tell they are good quality wooden legs. When I first opened the box, I thought it was going to be really hard to put it together. I assumed that because of the tilt function, there would be loads of extra little fiddly bits but actually I was pleasantly surprised. The instructions were step by step and super easy to do. A few screws to put it together, snap on a plastic cover to hide the screw fixtures and attach the cushion to the highchair, that's about it. Both boys wanted to try it out right away and loved it. The moulded seat giving them a comfy place to sit and the tray, which can fit to both seats, giving them somewhere to hold their food, or for Thomas, he likes to use it as a desk and do drawings on it. It is such a gorgeous modern piece of furniture, it may be a tad expensive at £269 but bear in mind that it can be used for years so you wont have to fork out more money as your children grow. Each and every aspect has been designed with parents and children in mind making sure it's simple and practical yet comfortable. We seem to always be struggling with money, especially at this time of year, just after Christmas we seem to have to tighten our belts a little. Saving for Christmas is a nightmare too. I always say that I'll save the spare money in our bank each week but I always end up treating myself to a nice expensive cappuccino and the saving goes out of the window. When I was asked to do the saving challenge whereby I would fill in the information on the graphic here, which is all about those little extras we buy, I was shocked at the amount it said that we actually spent on those little luxuries each year. 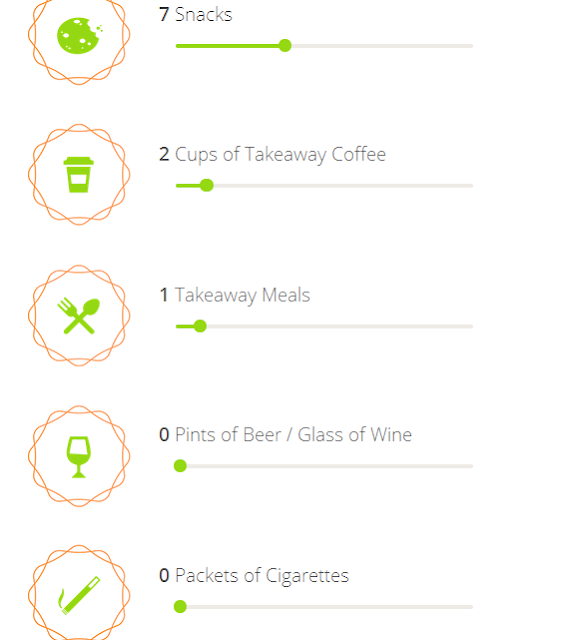 Snacks, coffee or a nice takeaway cost hardly anything but add them all up and it does accumulate to quite a big amount. 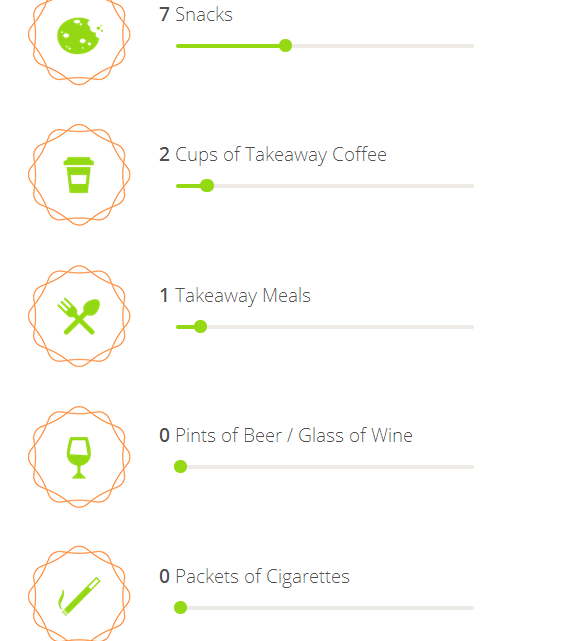 For me, I have usually a snack everyday, a takeaway coffee on weekends and a takeaway on a Saturday night. Other than that, I don't smoke and hardly ever drink so don't spend money on those items. I wasn't expecting it to cost that much on a yearly basis but was shocked for it to come back that I spend £580 on these small things. It then asked how much I would like to save from this amount. I thought for a while and then went with £250. This is because I was looking at short breaks this year, the cost of the one I liked was £250, yet we couldn't afford any of them so basing it on this, if I cut out some little things and can save that amount then we might be able to take that break next year. The graphic then popped up with what I should cut out to achieve my goal. 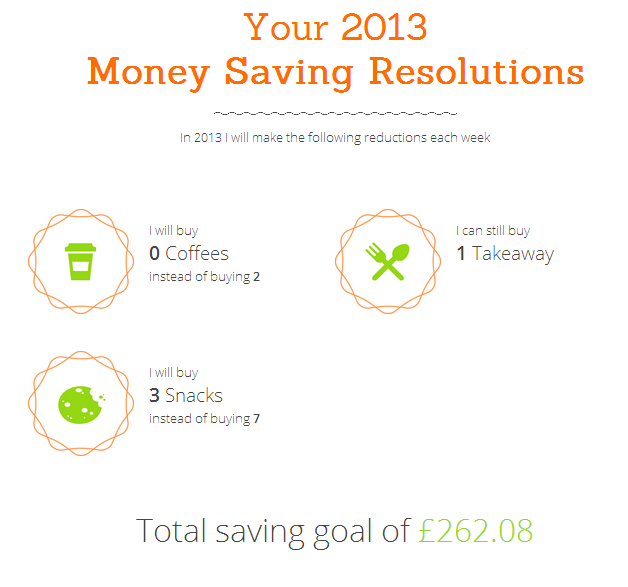 If I could cut out buying coffee and have 3 snacks a week instead of 7 I would save £262.08. This means that I can still have my weekend takeaway too. I was actually quite shocked at this, I mean such little things. Cutting out these things that cost only a few pounds could save me that much money in one year. I must admit, giving up my takeaway coffee was hard but I did it. The snacks weren't so bad. I really only bought them as I was in a bit of an habit of dropping Thomas off at Nursery and them popping to the shop and purchasing something. Keeping the money to the side that I would usually spend on these things, after the 2 weeks trial I had saved £12.80 (£2.00 per coffee and 60p per snack/chocolate bar). I was astounded that I had saved that in just 2 weeks of cutting such small things out. I also used Mamma Vouchers when shopping online to find deals and discounts on my shopping. I found this experience so fulfilling knowing that I was making such a big difference in such a small way. I will definitely be sticking to cutting out these items and hopefully next year we'll be taking our family break with the money I've saved. If your going to give this a go, give yourself a goal at what you want to gain at the end of it. Not the actual money that you'll save but what you will do with the money once you've saved it. This way you'll spur yourself on to keep cutting out the little luxuries as you know you've got something to enjoy at the end of it.